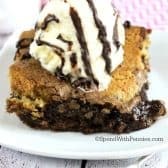 Serve it up with a scoop of ice cream and some fudge sauce for an extra special dessert that your family will go crazy for! !Follow Spend With Pennies on Pinterest for more great recipes! Preheat oven to 350 degrees. Generously grease a 9x13 pan. Combine brownie mix, 1/3 cup butter, 2 tablespoons water and 2 eggs in a bowl. In a separate bowl, combine cookie mix, 2 eggs, 1 tablespoon water and 1/3 cup butter. Place cookie mix in 2 tablespoon heaps around the pan. Place brownie mix in the pan in between cookie mix. Bake 30-35 minutes or just until set. Do not over bake. Serve warm with ice cream and chocolate sauce.